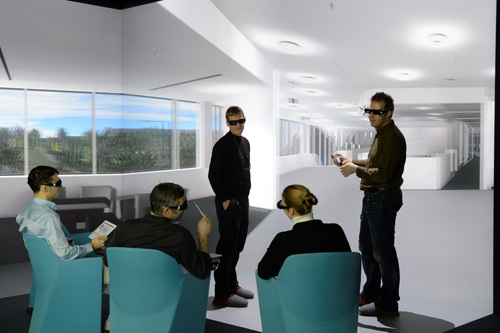 We (the Virtual Environments Group at Fraunhofer IAO) are promoting Immersive Engineering, the use of Virtual Reality technology for virtual prototyping, design review discussions among engineers, visual validation sessions with domain experts… all those great things. For this, a CAVE-like system is next to perfect: Not only is it capable of showing even large objects in a 1:1 scale, it also fosters communication, especially among interdisciplinary experts. This is the core of Immersive Engineering: Communication: Experts discussing the virtual prototype of a product. And IMHO, that is still done best in person. I cannot picture two engineers wearing HMDs doing that, because that would mean they cannot see each other (at least not their real selves). When I do try to envision an engineer using an HMD for his daily work, I see ruined keyboards and papers, because of knocked over coffee cups. I see scares and other practical jokes by colleagues… Granted: Those are not serious problems. But I also see dizziness or serious sickness, after a couple of hours of work. I see strained red eyes and sweaty, greasy HMDs after the first week. But maybe that’s just me. Hardly any special requirements to the environment. For LCD-HMD he wrote: Light, but low resolution. For CRTs (back then) he wrote: High resolution, but heavy, and high voltage at user’s head. Of course Dr. Müller was referring to HMDs of the 1990s and early 2000s, so let’s look at these characteristics from today’s perspective – what has improved since then? The static field of view of HMDs is greater; you don’t feel like a horse with blinders on, as much. The resolution is a lot better. The tracking is better, so the still great 360-degree dynamic field of view is more enjoyable, now. The immersion is still great, of course. Running on battery instead of cables, the maneuvering room should not be an issue anymore, at least not for a certain time of usage. Looking at Müller’s comparison of LCD- and CRT-HMDs, which of course is no longer an issue, the Oculus Rift combines the advantages of both: High resolution, little weight. And there’s actually another advantage my old lecturer forgot: Portability. When it comes to the disadvantages of HMDs, though, not much has changed. Distortions – I’ll give you those, they’re gone. All the other drawbacks are still there! you need to be able to grab a piece of paper (or an iPad, fine!) and write something down, or even switch contexts from the reality of a meeting-situation with 2D-material to the virtuality of the 3D-model, and back. And for these criteria, I don’t think it matters whether the Oculus Rift is „just another“ or „the best ever“ HMD, it is an HMD, period. 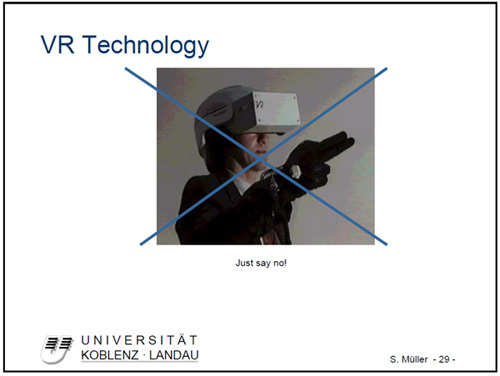 Müller’s point, that each user needs an HMD, I actually see as a plus for HMDs: Each user has the correct, undistorted perspective, whereas in a CAVE-like system nowadays, there is only one tracked user. In this respect, I am putting my money on projection-based Multiuser-VR, but that’s a whole different chapter. Now, I hope you don’t have the feeling, that this whole article is about bashing the Oculus Rift, because you’d be all wrong. I am grateful for the Oculus Rift, because the hype it caused, has reminded us to revisit HMDs. The concept of an HMD –the simple principle of putting a display directly in front of each eye, to facilitate stereo vision – seems natural. That’s the beauty of it. It is worthwhile to check every now and then, whether the latest incarnation of the HMD is good enough for a certain usage. Maybe even for Immersive Engineering. Which is why we have been checking, we are checking, and we will be checking, as soon as the next „HMD-revolution“ is on the horizon. The Oculus Rift is great for a lot of use cases. All I am saying is, it is not (yet?) as good for Immersive Engineering as our Immersive Engineering Lab. So, why do we not use Oculus Rifts for Immersive Engineering? Why do American Football Players wear so much more heavy and expensive equipment than European Football (Soccer) Players? Because they’re playing a different game!